Explorers: Timberlake and Bayliss - Explore! Explorers: Timberlake and Bayliss - Explore! This magazine is primarily about recreational exploring, but there is also the possibility of incorporating exploration into your career. Here you will find a little information about a couple of individuals that explore the outdoors as part of their career. The associated video will give you some insight as to what their adventures involve. I plan to add more articles about explorers, so check out the”Explorers” link to the right for any you may have missed. Dr. Julian Bayliss is an explorer and a biologist. He was searching Africa for areas above 5400 feet with high rainfall using Google Earth when he noticed a particularly green spot in Mozambique. He found that the area was a medium elevation rain forest surrounding Mount Mabu and that there was no record of biological finds in the area. It was, essentially, untouched by humans. 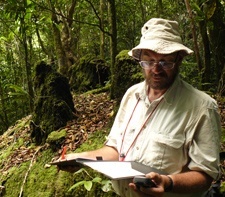 After Bayliss verified the situation on the ground, Jonathan Timberlake, a biologist from the Africa Drylands team at Kew Royal Botanical Gardens in England, brought together a group of 28 scientists from the UK, Mozambique, Malawi, Tanzania, Belgium and Switzerland and led the first expedition to Mount Mabu in 2008. Bayliss continued as one of the key project partners in Mozambique. At the time, Timberlake said: “The phenomenal diversity is just mind-boggling: seeing how things are adapted to little niches, to me this is the incredible thing. Even today we cannot say we know all of the world’s key areas for biodiversity — there are still new ones to discover. This is potentially the biggest area of medium-altitude forest I’m aware of in southern Africa, yet it was not on the map, and most Mozambicans would not have even recognised the name Mount Mabu. Kew is working with the Mozambique government to protect areas like Mount Mabu and encourage local people to value the forest for its wildlife. By conserving the plant life we can help secure a future for all the other creatures we saw there.” This expedition was funded by Defra’s Darwin Initiative and is part of Kew’s ongoing work with Mozambique’s National Herbarium to identify priority areas for conservation in the face of rapid development. Timberlake added, “The Royal Botanic Gardens, Kew is still involved in exploring the montane forests of Mozambique and documenting their plant life – Mount Mabu is just one of a series of peaks in the country that require more detailed scientific exploration. We urgently need to assess the biodiversity of these unique mountain habitats and then use this knowledge to help equip local people and NGOs with the information they need to develop practical conservation actions. The video is displayed from YouTube where information about its creator may be found. The header photo, by Julian Bayliss, is provided courtesy of the Kew Royal Botanical Gardens and is used with permission. It shows the team’s base camp on Mount Mabu. The text was written by Jerry Haugen, Pathfinder, and is ©2013 Global Creations LLC – All Rights Reserved. It was written based upon a variety of news sources and information from Kew Royal Botanical Gardens with special thanks to Bronwyn Friedlander of the Kew Press Office.